Biryani can be simple but not quick to tell you the truth. The meat needs it's own cooking time and then you have to cook the biryani on dum (in a sealed pot) so the flavors become one. All the spices and meat and the fragrant basmati rice get a new identity in a biryani as they all meld into each other. Yes, you should be able to taste the meat in the rice and the rice aroma should seep into the meat. It sounds difficult but the cooking technique ensures it is done nicely and effectively. This post would introduce you with the cooking procedure required to cook a brilliant biryani. The spices can always be optimised to your own taste. You can always choose your spice blends if you don't like some strong robust flavors in your biryani or add some fragrant flavors like mint or an overdoes of green cardamom if you wish, but take care to treat the spices and herbs in a way that the aromatics are not destroyed in the cooking process. 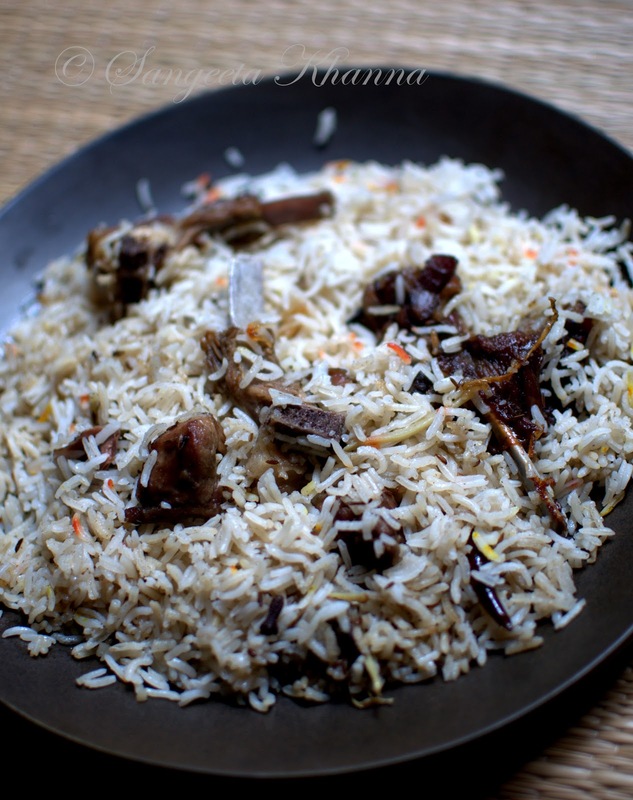 You want them all to get imbibed into the rice and meat if you are looking for a biryani. Awadhi biryani starts with making a 'yakhni' of the meat. Yakhni is a stock that includes some spices along with mutton pieces to be boiled with water for about 1.5 hours or more. This slow boiling allows the stock to be rich in flavors. I prefer adding a piece of fat to this simmering stock so the flavors get intensified. Using bony pieces of mutton is advised for making biryani, you would like to add a few bones to the broth/stock/yakhni if you planning to cook a biryani with boneless mutton pieces for convenience in eating. So there are three steps in making a biryani, the first involves making of the yakhni, practically the first in the procedure as it takes the longest time and you can do other prep work while this is being cooked. 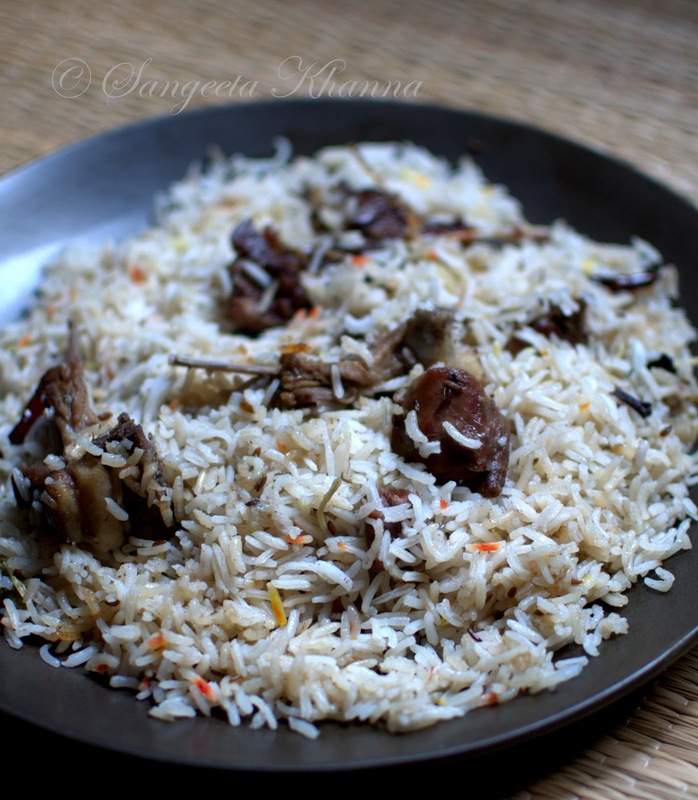 Then comes the cooking of rice with a few aromatic spices and the cooked yakhni. It is actually cooked into the meat stock and only till 3/4th done. The next step is to flash fry the cooked mutton pieces along with another fresh batch of spices and ginger etc and then layering the cooked meat with 3/4 cooked rice with a sprinkling of saffron and herbs if you wish. This layered arrangement is cooked on dum, that is in a sealed pot on very low heat for about half an hour or more. Depending on the quantity. I cook biryanis in large amounts most of the times when I have to entertain guests and that is the reason why I have never been able to click decent pictures. This time I cooked it for just the two of us, actually for 2 servings as small quantity of biryani is not worth doing. I clicked pictures as soon as I opened the dum pot, the wafting aromas making me weak in the knee, I actually tasted the biryani right then. Later I proceeded to make the raita and salad to serve with it and forgot again to click pictures of the serving plates. The mint raita and a tomato-onion kachumber salad is missing in these pictures. A well made biryani does that to you. Nicely separated, well cooked, well soaked rice and succulent pieces of meat, aromas to make you hungrier than ever, you would know when you cook this. spices for the boiling rice..
spices and other ingredients for the stir frying of boiled mutton pieces..
spices and other ingredients required during layering of biryani..
Add the mutton pieces to about half a liter of water and give it a quick boil. Drain the water immediately, fill the pot with 3-4 cups of water again and add the spices mentioned in the list for yakhni. Let the broth simmer for 90 minutes. Fish out the meat pieces from the yakhni once it is cooked. Strain the yakhni and discard all the whole spices. Add 2 cups of this yakhni to the washed and drained rice with the required spices and cook on low flame till 3/4 done. It takes about 25 minutes if done on absolutely low flame for this quantity. Meanwhile, heat ghee in a pan which you would use for dum cooking also. I use my heavy cast iron kadhai when the quantity is less, basically any pot that has a heavy base and a tight fitting lid would do. Add all the ingredients together into the hot ghee and fry till the spices get aromatic. Add the boiled mutton pieces and flash fry just for 3-4 minutes. You might like to add 2-3 pinches of a strong garam masala if you wish at this point. Do not fry the mutton pieces more than 3-4 minutes else they become dehydrated. Wait till the rice is cooked (only 3/4th done stage). Now layer the meat pieces with the cooked rice in the same pot. For a small quantity you can just fold them all together, do not mix thoroughly. Sprinkle the freshly grated nutmeg, mint and fried onion if using and the saffron too. Place the lid to seal and cook on very low flame for another 30 minutes. You can use dough to seal your pot if are not sure of sealing it properly. Remove the dum pot from heat after 30 minutes and serve immediately. 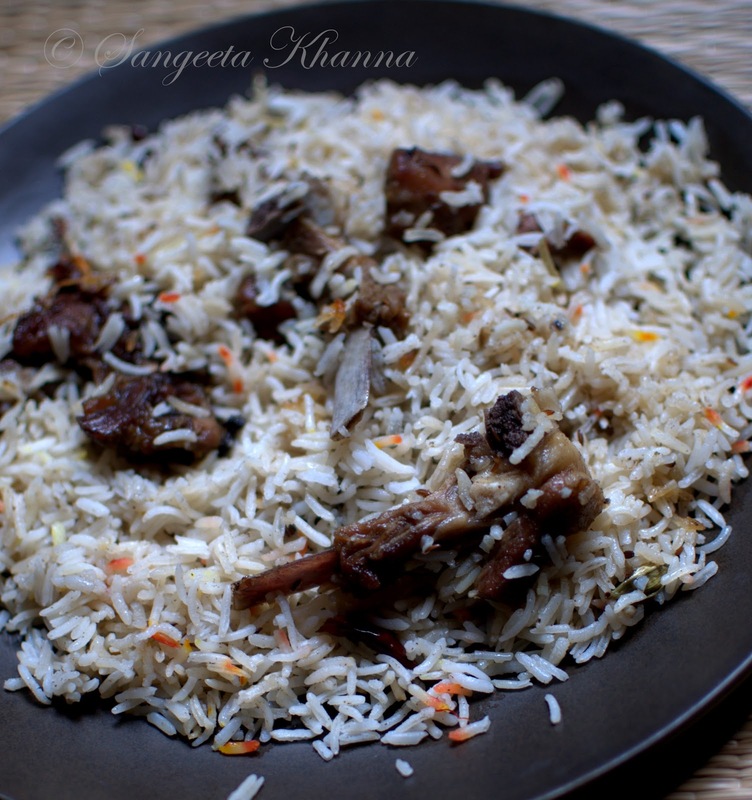 This biryani can be served after 2-3 hours after reheating in the same pot or into the microwave. The flavors get better after a while but the aromatic experience of opening the sealed pot at the dining table comes when you have it right away. A cooling raita and a tomato and onion salsa/kachumber type salad is what we like with our biryani. You can have it as part of a lavish spread but a raita and a roughly chopped and mixed, preferably dressed salad is a must in my opinion. I know some people who can have biryani on it's own and even for breakfast. Very soon I am going to bake a nice biryani in an Earthen pot I bought from Trade fair, seasoning the pot is falling prey to my habit of procrastination. Enjoy this biryani till then. I got to try my hand at this. Looks absolutely divine! This luks really super...but one doubt...can 3/4 cups of water be boiled for 90 mins & still be left for cooking the rice ...? oh it is 3 to 4 cups of water, not 3/4 cup. Also the water will keep 'simmering' on low flame and would not boil. So not much water is evaporated this way. Thanks for asking this question as someone else might have read it like boiling too. Simmering with the half closed lid is what is intended. And top up with more water if you feel it is evaporating too fast.